EC members present: Eric Brenner, Vicki Clinton, Salumeh Eslamieh, Stephen Fredricks, Katharine Harer, Teeka James, Dan Kaplan (Exec. Secr. ), Doniella Maher, Monica Malamud, Sandi Raeber-Dorsett, Joaquin Rivera, Paul Rueckhaus, Janice Sapigao, Elizabeth Terzakis, Rob Williams. AFT (non-EC) members present: Masao Suzuki (AFT Rep on District Budget and Finance Committee; Economics/Skyline), Karen Olesen (AFT/COPE Chair; Counselor/Cañada), Tom Broxholm (Skyline), Zev Kwitky (CFT field rep). The EC met in closed session to discuss confidential matters. Janice Sapigao read a statement of interest from Najla Abrou, who would like to become the PT rep to the EC. Remove FTES from campus allocation model, since the District is now basic aid and not funded based on enrollment. These proposals show that there is extra money in the District, and the District wants to somehow earmark funds for (a) and (b). Masao will write up his report and send it to Eric, so that this may be turned into an Advocate article. Eric reported on Skyline’s budget committee. He will be writing an article on the growth of administration in our District. Teeka has heard from some faculty that college presidents have failed to follow through with the results of the survey, and communicated areas of concern with deans. Other EC members echoed this—deans who had significant weaknesses have not shown any improvement. Teeka will talk to Ron about this; she will request a progress report about deans’ evaluations. We could do the survey in the spring again, to see if anything has changed. If the presidents are not willing to share the concerns that came out of the survey with deans, Teeka is willing to do this herself. Tom Broxholm believes that PT should qualify in order to earn their right for an evaluation, but if they meet the criteria then they should be interviewed. the hiring process is not the same for FT as for PT, so the fact that someone has been hired for a PT job does not necessarily make them fully qualified for a FT job. Interviewing all adjuncts in a large department could result in an enourmous burden for the screening committee. It was noted that our District has a record of hiring our own PT faculty for approximately 70% of FT openings. At this point, there is not consensus on whether PT faculty should automatically be granted an interview for a FT position. Joaquin presented two versions of the calendar for 2014-2015. One of the versions was approved, and Joaquin will forward it to Eugene. CSEA has started negotiations on medical caps. District proposed $35/45/55 (single/2-person/family) increase. Medical caps for FT: Ron called Joaquin and asked him if the AFT would agree to $50/75/100. Joaquin said that he thought it might be ok, but that we should also give a significant increase to PT. The EC directed Joaquin to ask for an increase in the district’s contribution of $100/150/200. Medical caps for PT: Currently, the PT reimbursement is $600 per semester. There is a maximum of 330 PT who qualify for this reimbursement. The EC directed Joaquin to ask for $1800 per semester. Dan informed the EC that the Labor Council and Building and Trades have already endorsed Measure H. EC took no action (no quorum). Our website is in the process of being redesigned. Eric showed a draft of the website, and two lists of options for organizing all the information in our website. A subcommittee will be making decisions about website design. EC members are all invited to send their input to Eric. Evaluation: they will be evaluated just like PT, but by a FT in a different college. The issue that remains unresolved is that the union insists that PT seniority should be respected when giving a teaching assignment to an administrator. Doniella: There is a Howard Zinn event this coming weekend, held at Mission High School in San Francisco; Elizabeth is one of the presenters at this event. Meeting adjourned at 5:15 p.m. The People of California vs. The Accrediting Agency for Community and Junior Colleges (ACCJC) testimony portion of the trial lasted from October 27, 2014 through October 31, 2014. The City Attorney of San Francisco’s case was directed at the action the ACCJC took to remove the accreditation status of City College of San Francisco (CCSF). The action in June of 2012 to place CCSF on SHOW CAUSE was the first sanction that CCSF had received. The assumption of the college was that since they hadn’t previously been sanctioned for non-compliance on any standard, there were no lingering requirements to satisfy standards. The college received a letter informing them to SHOW CAUSE why they should not lose their accreditation sanction and that they had a year to comply. In March of 2013 they were required to present to a visiting team a report on their progress. As one can easily calculate, the time from June of 2012 to March of 2013 is several months less than one year promised. A. Lack Of Adequate Controls Against Conflicts ln Violation Of 602.15(a)(6). B. Failure To Include Sufficient Academics On Teams In Violation Of 602.15(a)(6). C. Failure To Provide Due Process In Violation Of USC 1099b And 34 CFR Sections 602.18(e) & 602.25(d). D. Failure To Provide Notice And Opportunity To Be Heard In Violation Of Common Law Fair Procedure. The first witness on Monday October 27, 2014 was Alisa Messer – past president of AFT 2121 (City College of San Francisco). The last witness on Friday October 31, 2014 was ACCJC Commissioner Steven Kinsella. Other witnesses included ACCJC President Barbara Beno and Vice President Krista Johns as well as ACCJC Commissioners Frank Gornick, Tim Brown, Sharon Whitehurst-Payne, and Marie Smith. In addition to Messer and ACCJC president Beno, the People called Community College Chancellor Brice Harris, past CCSF Financial Officer Peter Goldstein, Community College Independents president Richard Hansen, former CCSF Associate Vice Chancellor for Governmental Relations Leslie Smith, and David A. Bergeron. Bergeron currently serving as Vice-President for Postsecondary Education at the Center for American Progress. He previously served as the acting assistant secretary for postsecondary education at the U.S. Department of Education. Kern Community College Chancellor Sandra Serrano (who is also a WASC commissioner and chair of both the 2012 and 2013 visiting teams) was called to testify by the ACCJC lawyers. There were twenty witnesses that testified by deposition. The actual behind the scenes discussions of Beno, the visiting teams, and the Commission are difficult to find out due to the imposed level of secrecy imposed on accreditation participants. That being said, some new disclosures were brought out during testimony that illustrated the bias of the evaluations, the ACCJC staff and the Commissioners themselves. The trial ended with Judge Karnow ordering that post trial closing briefs be filed no later than December 2, 2014. Closing arguments will be held at 1:30 p.m., December 9, 2014. After that Judge Karnow will prepare a tentative decision. The parties must then file written objections within 15 days, to be followed by the final decision. The People began with a statement that claimed that the ACCJC used unfair, biased, and illegal procedures when it decided to terminate the accreditation of CCSF and by so doing, violated the state’s Unfair Competition law. The remedy requested was a completely new start to the evaluation process (during which the CCSF would continue to be accredited). The judge had already decided, in agreement with the U.S. Department of Education, that the ACCJC had violated federal requirements when each of the Visiting Teams had only one faculty member on them. Both Beno and Johns, during their testimonies, stated that even though the teams were required to have significant faculty participation that there was not an exact number required. They claimed that no final decision on that issue had been made by the U.S. Department of Education. Beno testified that she did not make recommendations on what decisions should be made by the Visiting Team. As a reader (who writes up a summary for Commission consideration) she claimed that she only suggested grammatical and inconsistency changes. From her testimony it was clear that she played a much larger role – particularly outside the meetings of the Commission. “And it included your intended edits?” he asked. “It seems to, yes,” Beno said, looking down at a copy of the draft. “[The ACCJC] did not afford City College additional time to appeal the deficiencies before finalizing its determination, did it?” Flynn asked. Beno began to read from the draft document. Judge Curtis Karnow interrupted her, saying “That’s not the question.” “He’s not asking about the text, he’s asking about what happened in the real world,” Karnow said. Flynn’s questioning also revealed that the site visit team appointed by the commission to evaluate the college had come to several positive conclusions that were omitted or changed at Beno’s request. Among the deletions made at Beno’s suggestion was one that noted the college’s “high level of dedication, passion and enthusiasm” in addressing its problems. In the testimony later by commissioners, this deletion alone could have made a real difference in what they decided. In addition it was disclosed that the 2012 Visiting Team had only discussed Warning and Probation sanctions and ended up recommending that the Commission issue a Probation Sanction with a two-year reporting period. The Commission ended up voting the higher SHOW CAUSE sanction. In later testimony Beno attempted to save face on the question of the due process violation by introducing an invented distinction. She attempted to distinguish between “deficiencies” and “standards of noncompliance.” A “deficiency”, Beno said, is “a behavior that leads to noncompliance.” She then claimed that under the ACCJC’s rules, in the case where the Commission finds deficiencies not recognized when the final visiting team report is completed, the school must be given adequate time to respond. But, she went on, if it finds only noncompliance with standards, no such due process is required. She then went on to say that the Visiting Team only found new examples of noncompliance, not new “deficiencies,” so the due-process procedure wasn’t needed. Under questioning she could not produce any of the ACCJC policies and procedures that make that distinction. Under deposition last month, Serrano was directed to submit any record of communications between her and the evaluation team. Goldberg alleged Serrano did not submit any correspondence at the time of Beno’s edits, proving she did not consult her team. Instead, he alleged, she made immediate changes to the report based on what Beno had recommended. These changes may have ultimately condemned CCSF. ACCJC Vice President Krista Johns was another ACCJC witness who provided less than straight forward testimony. 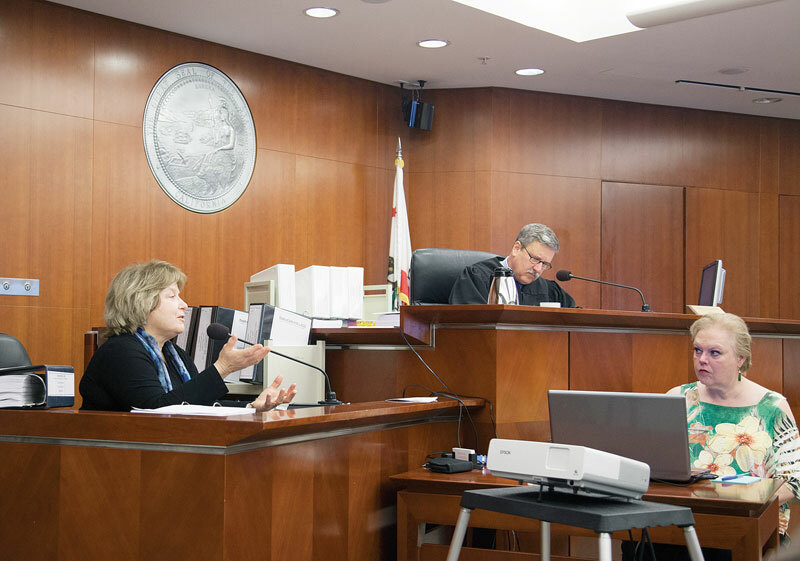 Deputy City Attorney Yvonne Mere attempted to make clear that the U.S. Department of Education had found numerous violations by the ACCJC and given it one year to improve – the equivalent of a SHOW CAUSE sanction. Johns tried to evade the question numerous times but finally gave a Yes answer to the fact that the Department of Education had found ACCJC non-compliant with the definition of an “academic” on a site visit team and with failing to maintain adequate controls over conflict of interest and appearance of conflict of interest. She also admitted that the ACCJC had changed its policies for the selection of commissioners after a complaint was filed by the state chancellor in 2010. Even though the ACCJC was told to elect Commissioners rather than appoint them, the Commission did not remove any of the Commissioners who had been improperly selected. Most of the Commissioners that evaluated CCSF had been chosen by the improper method. The violation of “academic” revolved around how many academics were on the teams that visited CCSF (only one on each team). The U.S. Department of Education found that having only one teacher on a team violated U.S. DOE regulations. In a deposition, Constance Carroll (the Chancellor of the San Diego Community College District) testified that the 2006 CCSF Visiting Team for which she served as Chair had found no deficiencies at CCSF. Despite this lack of warning that CCSF had any problems that were required to be fixed, Beno and others harped on the so-called “concerns” since 2006. Attorney Flynn reminded Beno during testimony that in 2013 the Education Department warned the commission that it was out of compliance with federal regulations when it used the ambiguous term “recommendation” when telling colleges to fix not only minor issues but major ones that threatened their accreditation. “The department found the commission’s use of (that term) impacts the ability of the agency to provide due process,” Flynn said. Beno called that and three other findings of noncompliance “preliminary.” “I refer to them as four findings of alleged noncompliance,” Beno said. Beno also stated on the stand that she still believes that having her husband on a CCSF visiting team was not an apparent conflict of interest nor was the fact that he came from an adjoining community college district that could benefit from the closing of CCSF indicate a conflict of interest. In regard to the power of Beno in the process, state Community College Chancellor Brice Harris told Judge Karnow that ACCJC President Barbara Beno swayed him to remove the CCSF elected board of trustees and replace them with Special Trustee Robert Agrella. Agrella then played a large part in the actions against ACCJC by testifying against the very college he was then the head of. Harris stated that Beno told him “she was fearful the college could lose its accreditation.” She believed the state takeover was the only way the college could retain its accreditation.” Harris also testified that if he knew now what he knew then he would not have followed Beno’s direction in removing the elected Board of Trustees. In his public statement explaining the action to remove the CCSF’s elected board Harris noted that “111 of 112 colleges are living under the ACCJC’s rules.” If he meant that 111 of 112 colleges had not been put under sanction then his statement was untrue. In fact, more than half of California’s community colleges have been put on sanction by the out-of-control ACCJC. Chancellor Harris served on the ACCJC in 2006, and worked with Beno previously. The appeal process that ACCJC uses also indicated a lack of due process. The first step in an appeal to a decision to close the college is a relook at their decision by the Commission that made the original decision. The next step is supposed to be the establishment of an independent panel to hear the evidence and make a decision on the propriety of the Commission decision. In testimony Krista Johns acknowledged that Beno appointed the appeal panel that included three ex-commissioners and a college trustee that conducted training with Beno. The challenge by CCSF to seating these members of the panel was rejected by the Commission and all served on the appeal panel. The biased appeal panel is one of the indications of lack of due process in the city attorney’s filing. The financial stability of CCSF was one of the major reasons given for removing CCSF’s accreditation. Alisa Messer testified to the severe loss of student enrollments since the ACCJC put CCSF on SHOW CAUSE. Since community colleges are funded based on student enrollments, the action of the ACCJC made the financial situation at CCSF more tenuous. But with the passage of a special parcel tax (Proposition A) in San Francisco which would bring in $15 million a year and the passage of Proposition 30 statewide which would bring in millions more, CCSF’s finances looked much better when the Commission voted to revoke accreditation. After Deputy City Attorney Ron Flynn reminded Kinsella that Prop. A would bring in millions of dollars a year, and the money would arrive within weeks of the commission’s revocation vote, he asked “Was that an improvement?” “No,” Kinsella said. In fact, as former CCSF Financial Officer Peter Goldstein reported under examination, from 2006 thru 2013 CCSF had always been above the 5% reserve level recommended by the State Chancellor’s Office. Alisa Messer and Peter Goldstein both testified to the salary cuts that faculty and staff received as well as other cost cutting steps the college took. It appears that the Commission, when it voted to end accreditation, was not made aware of these actions. During that time the colleges were receiving their annual apportionment late. As a result many colleges across the state borrowed money in order to meet a cash flow problem and legally booked the late apportionment in the year that it was state budgeted. CCSF did likewise. The borrowing of money was emphasized to the Commission but the routine nature of such action was not. In any case, CCSF was not in financial turmoil. The Commission was also not appraised of the salary cuts to employees during the recession. Commissioner Sharon Whitehouse-Payne testimony that “if we have to take a pay cut, that’s what we have to do” illustrates the lack of understanding by the Commission concerning CCSF efforts before they voted. In short, the picture given to the Commission was not accurate with respect to the actual situation at CCSF. The ACCJC has been attacking colleges for a number of years for not pre-funding their “other post-employment benefits (OPEB). The OPEB comes out of GASB 45 which is an accounting good practice which requires the posting of the 30-year amortized cost of such benefits as retiree health benefits. GASB 45 does not require pre-funding the liability – only putting the amount of the calculated long-term liability on their books. Colleges like CCSF have paid these retiree health benefits on a yearly basis based on the current year cost of such benefits. This process is commonly called “pay as you go.” CCSF, and many other colleges, have had a pay as you go policy for more than forty years without any problems. During the last six years, the ACCJC has criticized and sanctioned colleges, including City College, because they did not sufficiently ‘prefund’ their estimated liabilities based on the projected 30-year cost of promised retiree health benefits. This is a good example of how the ACCJC tries to inflict their version of good practice on colleges in a manner that is not generally accepted. During bad time putting such funds aside cause the cutting of classes. I have written a paper on this topic with regard to the impact on the Los Angeles Community College District. I point out in that paper that the cost of pre-funding is twice the cost of pay as you go. One motive of the ACCJC attempt to force colleges to pre-fund is the role that Commissioner Steve Kinsella and Commissioner Frank Gornick played in the development of the Community College League of California (CCLC) Retiree Health Benefit JPA (Joint Powers Authority). Colleges have been encouraged to bank their money in this JPA. A number of evaluation team members sit on the board of the trust fund. Kinsella himself has been placed by Beno as chair of at least four visiting teams as well as a number of other visiting teams as a team member. The teams he has chaired and been a member of have come down hard on colleges for not pre-funding. This certainly has the appearance of a conflict of interest. David Bergeron testified that he had spent 30 years with the U.S. Department of Education. He stated that the main purpose of accreditation is to ensure academic quality. He noted this as one of the reasons why there should be a significant number of faculty on visiting teams. He made clear that in his experience having only one faculty member on a team was not consistent with Department of Education requirements. Harris and Bergeron both went through the California Community College Scorecard for CCSF. In almost every category of academic excellence, CCSF placed above the average of community colleges in the state. Beno testified that the Scorecard does not measure any of the standards and thus did not count in the accreditation process as an indication of the quality of the institution. Chancellor Harris, in testimony, disagreed. Nowhere in the ACCJC defense was there any evidence that CCSF did not have an excellent academic record. If the college was providing a quality educational experience and continues to offer classes without ending with a negative balance, why close it? The City Attorney’s office has offered the suggestion that CCSF was being punished for opposing the recommendations of the Student Success Task Force (as did all of the faculty members on the task force). SB 1456 was eventually passed with letters of support from Barbara Beno. Beno claimed that the ACCJC and she did not endorse the Task Force Findings and the subsequent legislation. They only wrote that they supported each. I am not sure what the difference is. CCSF administration and one other college administration opposed SB 1456. Beno acknowledged her awareness that a few “individual colleges are more or less sensitive to the various recommendations of the task force.” Beno then denied knowing the CCSF opposed the bill even though the administration, in the name of only two colleges, had opposed. The bill included provisions favoring transfer and vocational education and played down the value of life-long learning. CCSF has, until the appointment of the Special Trustee, been proud of its support of the California Master Plan which called for community college opportunity for all adults who could benefit. CCSF opposed rationing of education and did what it could to not cut classes. ACCJC disagreed and stated that the college must face current realities and not serve the broad range of students that CCSF has so proudly served over the years. ACCJC called on the college to hire more administrators, put money away for future retiree benefits, cut the number of faculty and classified employees, and recognize the current reality that the Master Plan can no longer function as it was designed. The lawsuit filed by SF City Attorney Dennis Herrera, against the Accrediting Commission for Community and Junior Colleges, went to trial on Monday, Oct. 27. Five days of testimony revealed some of the failures of the commission to follow its own policies and the laws that govern accreditation. *Read a day-by-day account of the trial. *Read an in-depth analysis by Marty Hittelman, former CCC President. In photo, ACCJC President Barbara Beno testifies for second day.